When Elizabeth B., mother of three in Brooklyn, describes the birth of her first child "blissful" is the word she uses. "The sun was rising, and I had time for an epidural so [ I ] was pain free," says the 38-year-old attorney. "It was peaceful and lovely." Three years later Elizabeth was waiting in the crowded triage section of her local hospital with her second child ready to come out. "I started screaming and everyone told me to just relax," she recalls. "I yelled, 'No, the baby's being born – now!' I ran down the hospital hallway to the delivery room, and the baby was born just a few minutes later. It was very traumatic because it was so fast and painful." In the following weeks, Elizabeth struggled to shake off the panic and helplessness she experienced during those frantic moments. "I just kept thinking, 'Oh my God, that was so awful,'" she says. 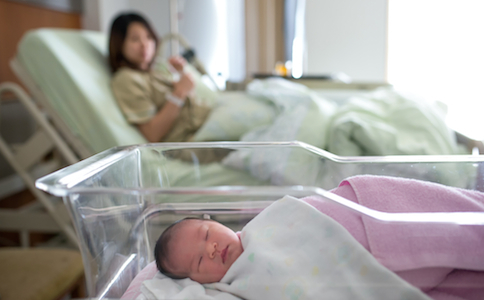 Disappointment after an unexpected childbirth experience is common. There is little direct research on the subject, but a recent study found that while 70 percent of women surveyed reported confidence going into labor, only 55 percent felt confident while giving birth. "I think it would be fair to say that, for many women, there was a discrepancy in the confidence they felt initially and how they actually felt as they went through the experience of giving birth," says study author Laura Attanasio, a PhD student at the University of Minnesota School of Public Health. "Though some women express satisfaction with their birth experiences and take pride in the result of their preparation, this is not the case for a majority," agrees Karen Kleiman, a licensed clinical social worker and executive director of the Postpartum Stress Center. "No matter how much control we would like to believe we have in this situation, sometimes the randomness of life prevails." And when it does, it's completely understandable for you to feel disappointed, frustrated, angry, or even guilty. But you don't have to. Here are six steps you can take to make peace with your birth experience. The first step sounds deceptively easy: Be honest about what you feel. But that can be hard when you hear the common refrain "just be happy the baby arrived safely." "Being real with yourself, and with your loved ones, about what you are feeling is a huge challenge," says Sarah Best, LMSW, a Seleni staff psychotherapist who focuses on birth trauma and postpartum anxiety disorders. But fooling yourself (or anyone else for that matter) can just lead to your real feelings surfacing more forcefully and unexpectedly in the future. Find a trusted loved one and tell your birth story, beginning to end, even if it doesn't fit with how you think your story should sound. "Talk, vent, debrief. Process your experience. These actions have been shown to be effective in reducing guilt and high levels of distress," says Kleiman. You can also write down your story, describing what you felt during each stage of the birth as well as the feelings that come up when you remember the event. And talking or writing about the birth you had hoped for, suggests Best, will help you identify what you feel you lost. There are countless reasons women blame themselves when birth plans derail, including societal pressure about what constitutes a "good" birth, the expectations of friends or family, and your own response to disappointment. For example, if you struggle with perfectionism or the need for control, a traumatic birth can be especially challenging – and the person you may be accustomed to blaming is yourself. The best approach to letting go of self-blame varies from person to person, says Best, who encourages her clients to "honestly acknowledge this tricky emotion so you can gently explore, challenge, and eventually move past it." Ultimately, being able to let go of blame is one of the most important steps to accepting your experience as it was, according to Kleiman. Once you have told your birth story a few times, and your emotions about it feel less intense, focus on where you showed strength in the birthing process. For instance, it takes tremendous strength to let go of the idea of a vaginal birth and agree that a c-section is the best choice for your baby. It also takes incredible endurance to experience a long labor and then undergo an emergency c-section, or to spend the first days or weeks caring for your newborn child in the neonatal intensive care unit. "If you are interested in finding where your strengths were, you will," says Best, "because they are there." Surround yourself with people that make you feel good right now. "Other people in your life may have very strong opinions," cautions Kleiman. "Filter what you hear from them." Decide which people you would like to have around you during this vulnerable recovery time. Ask your partner and loved ones to help by limiting the number of guests you welcome into your home as you recover. Then prepare simple responses to any unsupportive comments from family and friends. Try saying something like, "Things didn't go the way I'd hoped, and I'm still figuring out my thoughts and feelings about it. For right now, I'd rather not talk about it." Or simply say, "I'm feeling pretty sensitive and would rather talk about something else." If you don't get the support you need from your partner, tell him or her. "Be very specific about the type of support that you need," says Best. If that doesn't change things, seek help elsewhere. "Your partner may have his or her own feelings about the birth that are interfering with his or her ability to be supportive right now, so exploring other support resources might help you both heal faster," says Best. No matter how bad you are feeling, resist the temptation to keep to yourself. Isolation can prolong your pain or – even worse – increase it. Maintain an open dialogue with your partner and reach out to trusted loved ones. Talk to a friend or family member, share at a moms' group, join an online support community, or find a good therapist, says Best. Disappointment about childbirth does not necessarily lead to depression. But women are more vulnerable to depression when they are not given the opportunity to talk about their experience and process the disappointment for as long as they need to, according to Diana Lynn Barnes, PsyD, a psychotherapist in private practice in Los Angeles who specializes in women's reproductive mental health. For the first month following childbirth, it is normal to feel overwhelmed, disappointed, and at times, sad – a phase known as the baby blues. "Those first few weeks are not a time to make an assessment about whether you are traumatized," says Best. "There's nothing wrong with reaching out for support, but we expect things will be hard at that point." After the first month or two, however, if the emotions surrounding the experience continue to impact your daily life or you find yourself obsessing over the disappointment of the birth, it's a good idea to seek outside help, such as a support group or a therapist. Elizabeth B. was determined not to experience another traumatic birth, so she hired a doula for the birth of her third child. She talked with her husband, doctor, and hospital staff about the need to act quickly. And, sure enough, the delivery was even faster. "But this time, I was prepared," she says. "I knew it would be fast and I was dreading the pain, but I definitely felt more at peace." If you are in Greater New York City, you may be interested in attending the Seleni Institute’s New Moms Group. Learn more about all of our program offerings.